Until recently, it was assumed that the ink used for writing was primarily carbon-based at least until the fourth and fifth centuries AD. But in a new University of Copenhagen study, analyses of 2,000-year-old papyri fragments with X-ray microscopy show that black ink used by Egyptian scribes also contained copper – an element previously not identified in ancient ink. “The composition of the copper-containing carbon inks showed no significant differences that could be related to time periods or geographical locations, which suggests that the ancient Egyptians used the same technology for ink production throughout Egypt from roughly 200 BC to 100 AD,” says Egyptologist and first author of the study Thomas Christiansen from the University of Copenhagen. 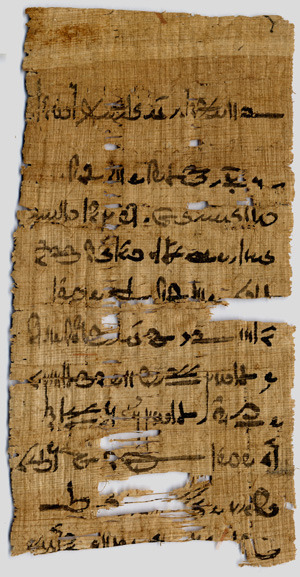 Fragment from the Tebtunis temple library in the Papyrus Carlsberg Collection. Click for a larger version. The papyri fragments were investigated with advanced synchrotron radiation based X-ray microscopy equipment at the European Synchrotron Radiation Facility in Grenoble as part of the cross-disciplinary CoNext project, and the particles found in the inks indicate that they were by-products of the extraction of copper from sulphurous ores. The studied papyri fragments all form part of larger manuscripts belonging to the Papyrus Carlsberg Collection at the University of Copenhagen, more specifically from two primary sources: the private papers of an Egyptian soldier named Horus, who was stationed at a military camp in Pathyris, and from the Tebtunis temple library, which is the only surviving large-scale institutional library from ancient Egypt. According to the researchers, their results will also be useful for conservation purposes as detailed knowledge of the material’s composition could help museums and collections make the right decisions regarding conservation and storage of papyri, thus ensuring their preservation and longevity.